CCA’s former Board President, Bob Silbernagel, is visiting Washington D.C. this week asking Congress why they let the Land & Water Conservation Fund expire in September. These are the chronicles of his endeavors. We finished up our second day of Capitol Hill advocating on behalf of Land and Water Conservation Funds reauthorization. The day wasn’t quite as long as Wednesday, but Kara Armano of Durango and I put in a good deal of time, nonetheless. We met with staff members for Representatives Mike Coffman and Ed Perlmutter, as well as for Senator Michael Bennett. We also joined with a group of mostly Coloradans representing the International Mountain Bike Association for several of our meetings. Third District Representative Scott Tipton met with us personally and stressed his continuing support for LWCF, but also said much will depend on how well the Senate and House can work together during this lame-duck session to get LWCF and several other important measures approved. 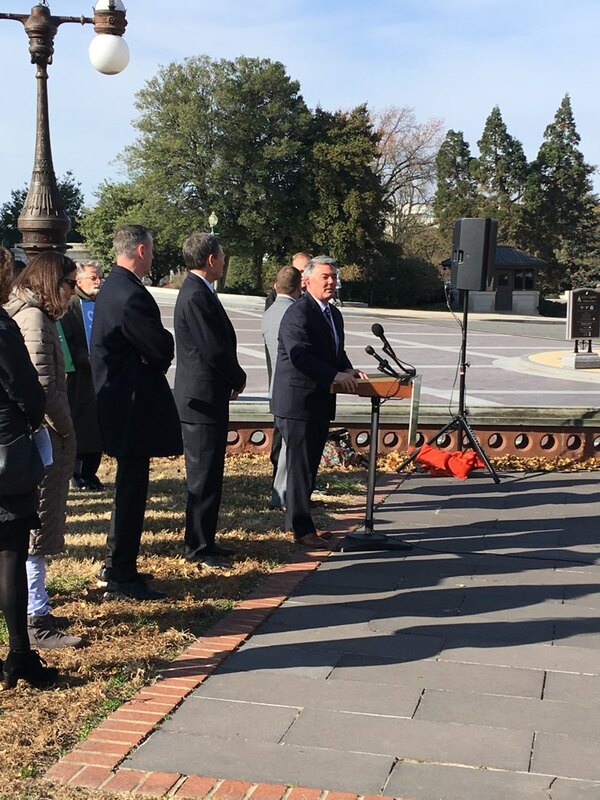 We also attended a press conference about LWCF that was led by Colorado Sen. Cory Gardner and featured senators and congressmen from both parties, representing Montana, Washington, Arizona, New Mexico and districts in New York and Pennsylvania. All pledged their support for getting LWCF reauthorization before they recess next month. I had the opportunity to chat briefly with Sen. Gardner afterward and he is optimistic that the goal of reauthorization this year will be accomplished. He and Sen. Bennett have worked closely on that effort, and are continuing to do so. Members of Congress, especially the leaders, are hearing a lot from their constituents about the need to reauthorize LWCF, and it seems to be high on everyone’s radar. There is good reason to be hopeful, while remembering that things could easily be derailed in these tumultuous last couple weeks of the session. It was a long day of meetings on Capitol Hill Wednesday. But encouraging. Kara Armano from Durango, representing Artemis, a sports women’s group, and I are the only people from Colorado on this trip. There are more than a dozen other folks representing states from the West Coast to the Atlantic Seaboard, and groups from the Audubon Society to Chambers of Commerce. Kara and I met with staff members from Senator Cory Gardner’s office, as well as staffers from Representative (and Governor-elect) Jarid Polis, Representative Diana DeGette and Representative Doug Lamborn. Thursday, it’s Representatives Scott Tipton, Mike Coffman, Ed Perlmutter and Senator Mike Bennett. The encouraging thing is that several congressional representatives told us there are ongoing discussions this week about how to deal with a variety of conservation issues in this lame duck session, and reauthorization of the Land and Water Conservation Fund is a high priority. Certainly there are other issues that will take up a good deal of Congressional time in the remaining few weeks of this session, but it seems like there is reason to be optimistic. Older PostWe're Hiring Two River Positions!